Last night I was able to go to the Cult of Cherry unveiling at my local MAC freestanding store. So much fun! I wanted to do a haul video last night, but by the time I got home, I ate and fell asleep, lol. I'll do one today and have the post up tomorrow. I get a lot of questions from readers who tell me that they can't find a foundation that keeps their oily skin at bay. The first thing I always suggest is using a primer. A primer is applied after moisturizer, and when dry, serves as a barrier between the oils in your skin and the foundation. This prevents the oils from breaking into the foundation/powder and turning your skin into an oil slick. I think primers are essential for making sure your foundation last, go on more smoothly, and it also fills in any wrinkles, acne scars, and marks that you need a little extra help with. I wanted to show you some of the different primers in my kit so that you can get an idea of what I use them for and why. Some people love this stuff, some people hate it. I think this product is pretty decent, but I mainly use this on clients with normal to dry skin. I think if I used this on oily skin it would make them even more oily. Because this is water-based, it's good to use with a corresponding water based foundation. I like how the product comes in a pump so it's easy to dispense onto a palette. The thing I don't like is how the package is black and cannot be screwed open. This makes you play a waiting game with the product...you can't really tell how much is left! I like to use this when my client has patches of red in their skin. The green in the primer really calms down the red and gives me a clear complexion to work with. It is more water based so it goes on with the consistency of a liquid. We all know about this primer. I think this is very comparable to my Monistat Gel but I keep it in my kit in case any curious eyes try to examine what name brands I have. We all know that many of us have a bias to using only high end products. Not that this stuff isn't great...it's perfect for those who have really oily skin and acne patches. I also place this specifically in areas where there are fine lines (around the eyes and mouth) for a quick wrinkle fix. I use this a lot on men as a type of anti-shine. I just make sure to flip the tube over so they can't ask questions about why I'm putting Monistat on their face, lol. This product is extremely similar to my Smashbox Photofinish Primer but I find that it is a tad bit thicker. I prefer using it on clients because it's easy to squeeze on a palette and it's about 5 times cheaper than the Smashbox alternative. I've heard good things and bad things about this primer. I personally think it works great on my own skin! The primer is peach colored, so I wouldn't use it on fair complexions because it may give them an orange tint. Instead, i'd apply this to medium to dark complexions that have fairly normal skin. Sometimes I find that if I use this by itself, I don't really need foundation. The peach color does enough to even out my skin tone. Next I want to try Laura Mercier Face Primer after my MAC Prep & Prime runs out. I've heard many artists use this, and after my girl May did a review on it, I really wanted to try it! Are there any face primers you guys recommend? Aw I'll tell her you think so! I was so busy running around, I barely saw you lol. Didnt you love it? Did you taste the Chocolate Martinis? I saw that girl you were with, I think shes from your portfolio with the pretty indian makeup? Shes so tall and pretty! and those lip colors are so nice! I love Bing and Liqueur. Thanks for all the primer info! It really does help to make the makeup last. I got the LM primer as a sample, used it a few times, honestly to me it feels like the smashbox one, like thick and siliconey. It does make everything smooth and happy, then again i use mineral make up. kind reminds me of the bare mineral primer too. i have the smashbox primer, too. the peachy colored one. i like it, but LG spackle works better. my mattifiers in my tzone have become my primer as of late (i love double duty products-- oil control primers!). 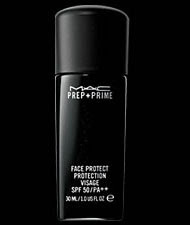 mac prep and prime didn't do much for me, although i used it because i bought it and like you said as a barrier between my skin and the foundation. i'm interested in LM's primer. i got a sample so i hope to remember to try it. Wow, i never ever knew about the monistant. My primer has been by facetime. It has jojoba oil and my skin looks and feels so fab after i use it. Thanks for this post! I don't use primers on a daily basis, but when I do, I use the Camellia Rose Skin Soothing Primer, and it works pretty well. I also have the Monistat gel in my stash. I really want to try Smashbox, though. Hi there-you give such great advice and pleased you had a good time too! It is crazy Ren we think alike on some things. LOl. I just watched ur video on cult of cherry haul and we basically bought all of the same things except I bought most of the lipgloss except for rich&ripe and the piggies. Can the Smashbox Photofinish Primer be use in your t-zones only? I have a sample pack of it, afraid to try because I breakout easily. I don't really use face primers because the only spots that gets oily or shiny is my T-zones. I've had some luck with M·A·C Matte (takes away the shine and no breakouts!) & also Blot powder! Those two works for me, so far! I'm hearing so much rave about Monistat's Chafing Relief Powder-Gel, can it really take away shine w/o making you breakout? Is it good as an eyeshadow primer too? i;m just like you... I think foundation is so important when it comes to makeup and the only thing to keep it fresh and flawless is PRIMERS so I'm always trying new ones!!! I'll have to try the one you are currently using.. not th eMAC on but the other one you mentioned! hey sweetie! i love your youtube vids. i dont even know how i stumbled across it but i love them! anyways i thought id just stop by and tell you how awesome your blog is!! Monistat!! Wow- I've heard it before, but haven't had the guts to try it out.. I added you to my blogroll. Could you please credit me as Hooked on Beauty. I can't wait to see your MAC haul!!! i have combo skin but i still use primers in color to neutralize my skin color. just not too much. u must definitely try the laura mercier foundation primer. i love it but i beg to differ from ethereal because i feel that the smashbox is 'drier' and has more of that silicone feel while the LM one is silkier. I use the LM primer on myself, it's finished now and i'm getting another one for work too. I like powdery primers as they don't interfere with my sunscreen and keeps my face matte-er all day. I like Pure luxe and silk powder from different brands. Btw, I loved the dark lippie on you in your video. Cult of Cherry hasn't reached our shores yet but I cannot wait to see the line! hello i hope this isnt tooo late...im just wondering do i use primer only when i use powder foundation? what about liquid foundation..
Hi Ren Ren... just to colaborate to your post... on the rimmel face primer... im a nc25 and it disapiers on my face.,.. no tint at all.... and i like it so far... just so you can try it on fair skin... its a good primer for oily and shiny skin..